Consumer finance markets are being transformed by the increasing mobility of people, products, technology, and information. This presents challenges for understanding changing consumer behaviour and building adaptable business models. Researchers are rising to meet these challenges by adapting their frameworks and methods to take account of mobility's effects. I present three cases of method adaptation to consumer finance research (financial diaries, object-centred interviews, social network analysis) and discuss their contributions. The complexity and personalisation of consumer finance requires us to not only be more creative with how we approach research, but also more robust in questioning our assumptions, framing appropriate questions, and designing research that draws frameworks and methods from multiple disciplines. Gone are the days when consumers did their banking in their local village or “high street”: instead, products and providers can (within regulatory and practical limits) reach consumers anywhere around the globe. People access financial services and information as they move around their cities or travel internationally. A person can pay their credit card debt while riding in a train, do their grocery shopping online as they sit in a café, bet on a football match while perched on a public toilet, or buy illicit drugs using Bitcoins as they head out for the night. Along with people and products, information is also far more mobile. People can find extensive product information online, and they can share their personal information far more easily. Business models are also changing, because the “unbundling” of banking, new technologies, and regulatory reform make it is easier for start-ups with highly specialised products to enter the market. These changes make both the supply side and demand sides of the market more difficult to understand, presenting challenges for understanding changing consumer behaviour and building robust business models (CGI 2014, Muller et al. 2011, Xiao 2008). It is impossible to predict the future: we cannot foresee how consumers will respond, which service providers will come to dominate the market, or what new technologies will threaten data protection methods we currently view as fool-proof. Zwart (quoted above) and others have argued that, given this uncertainty, our best bet is to focus on what consumers are doing and how their practices are changing. This approach makes sound business sense, since it is consumers, after all, who make purchasing decisions. However, it makes one critical mistake: it assumes that “consumers” are somehow separate from “the market.” But they are not. (Nor are consumers necessarily individual people, but that is a matter for another paper.) To understand what consumers are doing, we need to know as much about market characteristics and trends as we do about consumer themselves. A consumer-centric approach should not end at the front door of the household. It should consider consumer behaviour within market contexts, however messy. Prediction per se may be out of reach, but we can anticipate likely futures if we adapt our conceptual frameworks and methods to the current state of the market. This will help us plan for risk mitigation while creating products and platforms that benefit society. To do so, it is useful to understand how the market is changing and why. I argue that the root cause of changes in the market for consumer finance is the increasing mobility of technology, products and services, information, and people. I present a framework that takes mobility into account in consumer finance research. First I discuss why mobility is a central feature of money, and explain how it is transforming consumer finance practices today. Second I asses some adaptations of methods to consumer finance research. Finally, I argue that since mobility is generating more market diversity, a greater number of research problems are located in the long tails. This means we are unlikely to find answers through research that takes a normative, business-as-usual approach. Instead, we should look more broadly across methods, disciplines, and professions for clues that can help us shape robust research. Consumer finance globally is undergoing a transformation resulting from the increasing mobility of people, products, and information. These changes make both the supply side and demand sides of the market far more difficult to understand, presenting challenges for understanding changing consumer behaviour and building robust business models. The digitization of financial services and the near-universal penetration of the Internet has transformed the market for financial services for both consumers and financial service providers alike. Digital financial services are integral to the transformation of consumer finance from something that happens within domestic market, defined by national borders, to a practice that integrates (or implicates people, providers, and regulatory bodies around the globe. For consumers, the proliferation and specialization of financial services means that they are no longer limited to using local providers: instead, they can choose between products and services from around the world. While many people still choose to use local products, the trend is towards the diversification on all fronts: products, providers, point of origin, and so on. For service providers, the ability to access both consumers and other businesses through the Internet has transformed business models. While traditional retail banks retain a strong position in consumer finance markets, they need to partnering with other providers in order to retain access to consumers, and innovate new products and services. This increasing mobility and market transformation is partially a manifestation of globalization. However, financial products and services present a special case, because financial instruments have always depended on mobility in order to function. Money, whether in the form of coins, shells, banknotes, tally sticks, promissory notes, or digital currency, has to be transportable if it is to be used as a means of payment between geographically distant buyers and sellers. Shifting to electronic money increases money's functionality and transaction speed, but it does not introduce a new feature to money. Mobility also drives the spread of financial technologies around the world. When people migrate beyond their locales, they take their monetary technologies with them. From as early as the 16th century, global trade propelled the development of financial tools, including promissory notes and the stock exchange. By the mid-1800s, telecommunications systems, such as the trans-Atlantic telegraph, were used to wire money internationally (Stearns 2011). For the first time, monetary values no longer needed to be moved in the form of tangible material things, such as paper or metal, but instead could be sent in the form of an electric current. Hence the basis for digitization was born. By the early 20th century, the coins and banknotes that we recognize today had come to dominate over alternative forms of money (such as shells, livestock, and precious metals). During the second half of the 20th century, consumer finance in wealthy countries underwent a process of centralization as people came to rely on banks to supply all their financial needs, including savings, cheques, personal loans, mortgages, and life insurance. Thus retail banks took up a prominent role in the development of formal financial products and services globally. For decades, in many countries everyday banking primarily involved visiting a bank branch in one's local town. Other financial services providers existed, including international money transfer services, insurance companies, pawnbrokers, and loan offices, but they rarely threatened the monopoly of banks. The dominance of retail banks was shaken by the spread of mobile devices and Internet access (Maurer, 2015). Retail banks continue to dominate consumer finance, with annual revenues amounting to around $3.4 trillion globally (McKinsey 2012). However, transactions are increasingly digital and international, and this creates a basis for the proliferation of services beyond banks. The World Payments Report 2013 states that in 2012 there were around 333 billion non-cash payment transactions, and that m-payment transactions are expected to reach 28.9 billion in 2014 (CapGemini 2013). In 2012, global remittances reached $401 billion (World Bank 2015). At least as important as revenue and transaction figures, are the numbers of people served. There are around five billion adults around the world using financial services, of which approximately two billion adults worldwide are without a formal bank account (World Bank 2015; Demirjuc-Kunt 2012). Nearly all adults in the world—and many minors—consume financial products and services. Even my fourteen-year-old niece bought travel insurance on her iPhone before heading away on a school trip. In the more traditional retail sector, consumers are still provided for by retail banks, credit unions, mortgage brokers, and payday loans companies, among others. At a national level, the digitization of finance has resulted in an increase of domestic products and providers, such as transport cards, online payment systems, and digitized parking meters and applications. At a global level, consumers can access a wide range of monetary and finance tools, including Google Wallet, Paypal, Bitcoin, money transfer services, insurance products, and investment advice. Newer, non-bank industries include payments services, mobile banking, mobile money, e-wallets, and microcredit. In countries with large “unbanked” populations, the technologization of finance is helping people to skip the transition from retail banks to other service providers altogether. Extending banking networks to cover larger geographical areas requires a great deal of infrastructure and investment. Instead of investing so heavily in banks, basic financial services are being offered through microfinance agencies and mobile phone-based systems. Mobile money is an example of banks partnering with mobile money operators (MMOs), often telecommunications companies, to provide basic banking services via ordinary mobile phones. Mobile money gives people access to a range of services under the one platform, including domestic and international transfers, merchant payments, savings accounts, insurance, and credit. These services replace or complement a wide array of informal services, speeding up transactions and reducing costs. Consumer finance service providers have become dependent upon business-to-business collaboration. Just as the apparel industry has long outsourced production throughout a widely distributed value chain, so is consumer finance moving from a situation in which retail banks offer a full-service model to the radical specialization of production and distribution. Rather than building all their products and services in-house, banks increasingly partner with third party providers, either to reduce costs or avoid being left behind. In the past, strict regulations and the need for substantial start-up capital limited financial service providers to a mere handful for each jurisdiction. Today, however, it is far easier for new players to enter the market in most countries. This is partly due to the relaxation of regulations, and partly due to the fact that technology makes it far easier to bring products to market and reach consumers. Non-bank providers have a several advantages over traditional banks, including low overheads, limited capital requirements, no legacy systems, and often a more flexible corporate culture. In response, banks have had to alter their business models. Banks will probably continue to play an important role in this market, but the interfaces (APIs) behind the software customers use to access services will increasingly be branded with non-bank names. The development of this post-Fordist production chain is still very much incomplete, and there is a great deal of uncertainty in the market. First, the instability of regulations means that it is risky for companies to plan for the future, since they do not know what products and services they will be permitted to provide, how to provide them, or to whom they can market them. Second, despite intense speculation by fintech analysts, it is far from clear which companies will emerge as the dominant financial service providers. Business must speculate on where their main competition lies, and which companies they would best collaborate with. Third, while data analysis can identify current trends, the market is simply too complex (and extensive) to make robust predictions. Consumer behaviour is particularly difficult to predict, since it is necessary to both quantify trends and understand how people make choices with respect to their current and future needs. Yet we have little idea which directions these transformations will take, or what issues consumers will encounter in the near future. Technologists have a tendency to be optimistic when it comes to imagining the future of financial consumption, especially when it comes to imagining the potential of innovative technologies such as blockchain and product APIs. Yes, it is true that there are some exciting financial technologies and products appearing on the market, and promises of further innovation. Yes, it is true that many consumers are experimenting with new kinds of products and services, and that their choices expand substantially when they can access a global marketplace. But in their optimism, some technologists idealize what is possible without sufficiently taking into account actual human behaviour, which often follows a different set of norms and rules that don't fit into either old or new business models. It is likely that it would be very difficult for consumers to understand the multiplicity of ways in which they could access their account information, depending on the providers and/or the interfaces used by those providers, and therefore to understand the implications of giving consent. Another limitation long noted by experts and financial institutions is that financial products are known to be “dissatisfiers,” products that people aren't really interested in, but which they must use to achieve other ends (e.g., paying for insurance online). If people are uninterested in financial products, will they embrace the choices that open banking and financial service diversification offer? Or will they keep using the same old products in the same ways as before? Which kinds of consumers will diversify their choices, and which will not? Who will benefit and who will be exposed to greater risk? Consumer finance researchers are faced with the task of tracking these diverse and complex changes and predicting their effects. Figure 1. 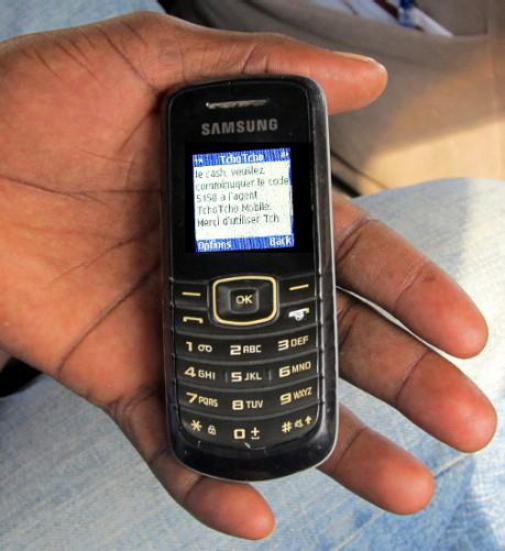 In Haiti, people send money and make payments using an ordinary mobile phone. Photograph © Erin B. Taylor. Innovative methods in consumer financial research can better illuminate consumers’ thought processes and practices as they adapt to a shifting market, and also help businesses to adapt their product development and business models. Researchers from both industry and academia are innovating new ways to record and analyse the financial behaviours of individuals and households. Quantitative approaches that make use of massive amounts of personal data have received a great deal of attention for their ability to illuminate behaviour and identify market trends. Rather than repeat the many discussions on the value of “big data,” in this paper I focus on innovations in qualitative methods (some of which include quantitative components. Methods such as ethnography, interview methods, financial diaries, online / offline studies, experiments, and social network analysis are being reconfigured to account for the increasing mobility of products and services through accessible digital spaces and technologies. Qualitative methods are particularly adaptable to researching in fast-changing environments because they are open-ended, which enables them to be adapted to changing circumstances in the field. They are also specifically designed to look at the larger context in which human behaviour occurs. For example, in our research on mobile money use in Haiti, my colleagues and I watched how people made transactions on their phones, talked with them about why they made certain choices, and followed them as they went about their daily life to witness what circumstances prompted certain behaviours. We also tested the mobile money infrastructure ourselves in dozens of locations, talked with regulators and telecommunications providers, and analysed mobile network maps. Ultimately all this information fed into a report, Mobile Money in Haiti: Potentials and Challenges (Taylor, Baptiste and Horst 2011), in which we mapped out the possibilities for the future of mobile money, given the current state of the market, infrastructure, regulations, and consumer needs. Below I describe recent adaptations of qualitative methods to explore mobility issues in consumer finance, presenting three methods and case studies that were originally described in the Consumer Finance Research Methods Toolkit (CFRM Toolkit) (Taylor and Lynch 2016), a collaboration between Canela Consulting and the Institute for Money, Technology, and Financial Inclusion (IMTFI). All of these methods and case studies are “ethnographic” in that they pay attention to context and incorporate a range of methods or sub-methods within a single research project. I briefly summarize the methods, present the case studies, and discuss their implications for understanding the effects of mobility on consumers’ financial behaviour. Many assumptions about how people manage their finances are incorrect or misguided. Financial diary studies are an excellent tool to investigate how a household manages its entire financial portfolio, and tend to excel at overturning our assumptions. This was well demonstrated by the Portfolios of the Poor financial diary study (Collins et al. 2009). First, this study demonstrated that poor people's financial problems do not generally stem from financial mismanagement. Rather, they stem from a lack of resources. Second, it showed that people are highly adept at combining a diverse range of formal and informal tools to manage scarce resources. Third, it demonstrated that people use financial tools in combination, not in isolation. If we focus on how people use a single tool, rather than how they manage their entire “portfolios” and toolkits, then we run the risk of misunderstanding how and why they choose certain tools. Briefly, financial diaries are a method of collecting data on financial behaviours by using a “diary” to record transactions. The financial diary method was pioneered in the late 1990s by a group of researchers with expertise in economics, finance, anthropology, development, and architecture (see description in Taylor and Lynch 2016; see also Collins et al. 2009). The method has since been applied by numerous social scientists working in different parts of the world.